Wondering if this is a lesser black backed gull or herring gull. Thanks for your help! This was from St. Catharine's, Ontario, today. Herring Gull. It's a tough one to explain, but I usually find Herring dirtier and smudgier, and Lesser Black-backed cleaner. If you see it fly, LBBGs have a much more contrasting white rump as well. Head profile is a good one too, Herring is much blockier in general then LBBG. 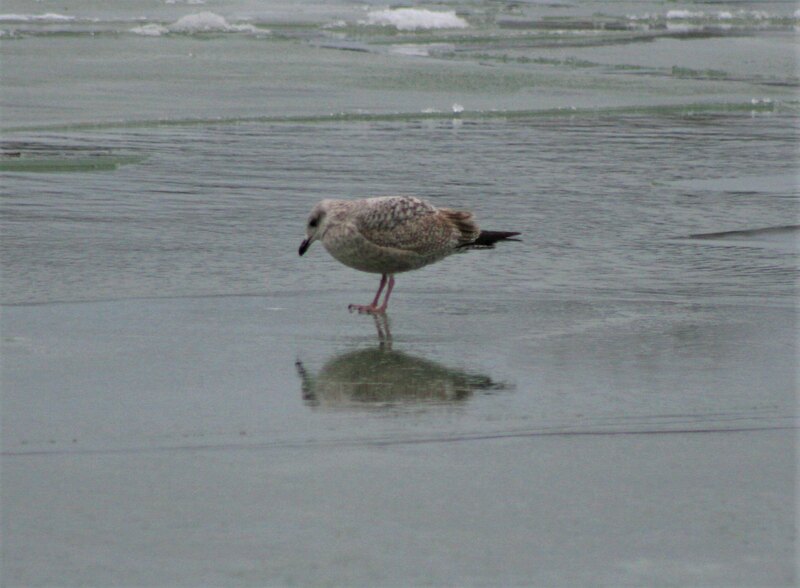 Lesser BBG has yellow legs and feet, Herring Gull has pink legs and feet as appears in photo. Young Lesser Black-backs have pink legs and feet, as do many other young gulls. Not in this plumage. Adults have yellow legs. This is a first-cycle bird. Edit- The Bird Nuts beat me to it.